Project Sekong 2014: We partner with the Lao Disabled Peoples Association to lead villagers to help in Pakse and Vientiane. 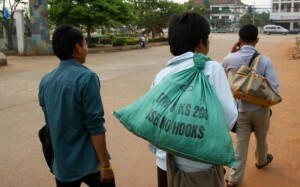 Because Vong is a disabled ethnic minority he has an affinity for helping people from remote villages find assistance. As a boy, he struggled to walk long distances to attend school. His family encouraged him because they knew his disability would prevent him from succeeding as a farmer. Vong knew he had no future as a farmer. He was born with a deformed leg that makes walking difficult and arduous labor in the rice paddies impossible. He’s unlikely to marry well, if at all, and a farmer without a helpmate has, as we in Wisconsin know, a handicap worse than a gimpy leg. Vong’s parents foresaw his bleak future and encouraged him, more than they did his siblings, to strive for an education. The education that Vong aspired to required him to leave his village, on foot, every Sunday afternoon and walk eighteen miles to Dak Chueng town where he could lodge with a family and enroll in a secondary school. He attended classes throughout the week and then, on Friday afternoon, walked back to his village to spend the weekend with his family. A few other teens from his village attended the same school and made the same walk. But they all had two good legs and could complete the walk in four hours. It took Vong ten. And since he walked alone they were lonely hours. On each outbound leg of his weekly journey he was further burdened by the obligation to carry twenty pounds of rice to his host family in payment for his room and board. Vong now works for the Lao Disabled Peoples Association and has been instrumental in helping me arrange for treatment of several village children who have medical conditions or birth defects. Saying that Vong is “employed” by the association is a wee bit of a stretch. He has the job and a modest title but the association has no money to pay him a salary. The only benefit he receives is a roof over his head—not a house or apartment nor even a tiny room—just the right to sleep in the organization’s office. To keep body and soul together, Vong sits a table along a roadside near the office, and sells lottery tickets. He makes about US $12 a week doing that but looses income when he leaves the table to meet with a disabled villager and perform advocacy. The villagers that Vong led to Pakse and Vientiane had little travel experience. One family, lacking a suitcase literally packed their bag. With Vong's help all the patients made it to their appointments and received successful treatment. I’ve engaged Vong in his official capacity to accompany a child and his father to Vientiane next week— a boy with a tumor who, come hell or high water, must be at Mahasot Hospital on the day that a team of visiting surgeons from Australia will be evaluating candidates for treatment. (Miss the appointment… miss treatment…better luck next year). I sense that I’m providing Vong with his proudest moment and perhaps his greatest adventure. But I am also pulling him away from his roadside lottery sales and that surely means a loss of income. I plan to pay him for whatever income he loses and then double that figure so he receives the affirmation that his professional skills are worth more than his lottery sales.